Designed with convenience in mind, the RightHeight™ Built-In Pedestal raises the height by 7 inches. It may not seem like a lot but it makes loading and loading much easier than having to bend over to reach socks that got stuck in the back. Keep your clothes and your confidence at 100%. 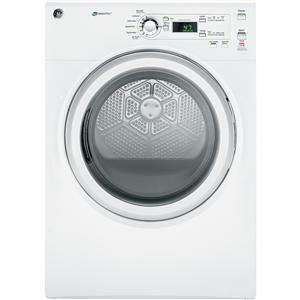 Steam penetrates fabrics causing them to loosen up and unfurl wrinkles and release odors. Whether you need to keep your favorite shirt looking good or take the camp fire smell out of your jacket, the Steam Refresh setting will help you out. Save precious ironing time in the morning when your preferred work attire is wrinkled from a lengthy stay in the dryer or were cooped up in the closet too long. Do not waste precious morning time waiting for the iron to heat up. 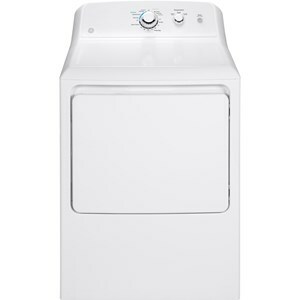 Those wrinkles can vanish quickly while sanitizing and refreshing your clothes with GE's Steam De-Wrinkle. Give your wrinkled clothes about 20 minutes with the steam cycle while prepping breakfast or getting ready for the day, and everything will come out perfect. Now, you can feel as rejuvenated as your clothes do without the hassle of ironing. Stainless steel interior simply means quality. Stainless steel drums are more durable and longer lasting than ceramic and plastic dryer drums. 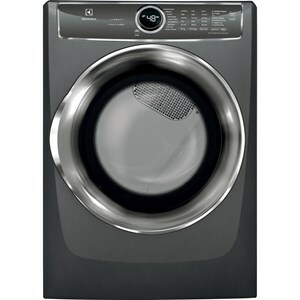 They are also more resistant to odors and discoloration. Bulky items have a tendency to make laundry time a workout. When these items get twisted and tangled, not only does it take time to unwind them, but they do not dry evenly when not unraveled. Now, twisted sheets and comforters become a thing of the past with a setting which does the disentangling for you. 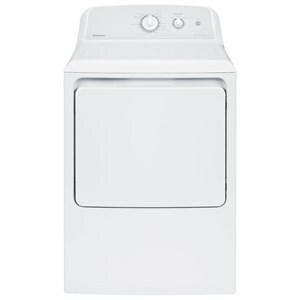 When you select "Detangle," the dryer pauses the cycle and reverses direction in order to reduce wrinkles and separate items, which means you can say goodbye to the difficulties of dealing with contorted comforters and sheets. 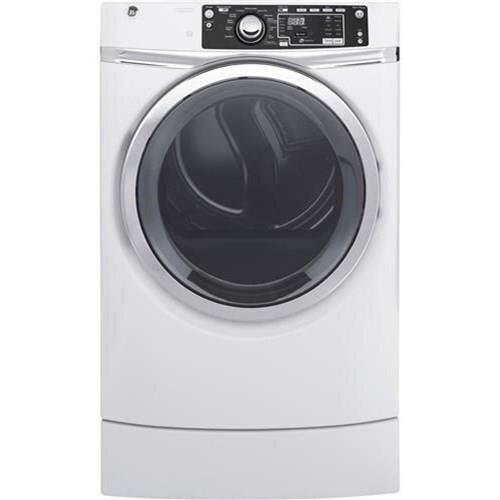 This appliance was specifically designed to use less water and energy than standard washers with the same cleaning power. Rest easy knowing that with every load of laundry, you're doing your part to help preserve the environment and saving money at the same time. 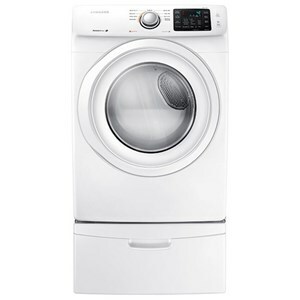 The Electric Dryers - GE 8.3 Cu.Ft. 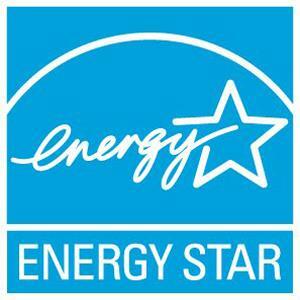 capacity RightHeight™ Design Front Load electric ENERGY STAR® Dryer with Steam by GE Appliances at VanDrie Home Furnishings in the Cadillac, Traverse City, Big Rapids, Houghton Lake and Northern Michigan area. Product availability may vary. Contact us for the most current availability on this product. 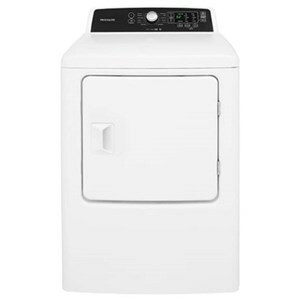 Width (side to side) 28"
Depth (front to back) 34.375"
Height (bottom to top) 47"
GE electric dryers make a difference when it comes to drying, whether you're remodeling or moving and looking to upgrade or just looking for a dependable model. 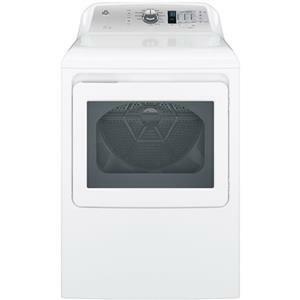 Great features such as sensor drying, steam drying to prevent wrinkles and Dura Drum interior to ensure longevity make GE electric dryers a great choice for your home. 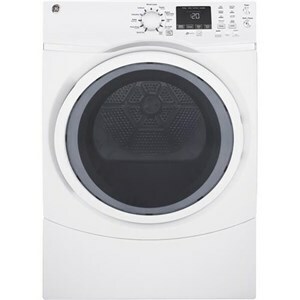 The Electric Dryers - GE collection is a great option if you are looking for Appliances in the Cadillac, Traverse City, Big Rapids, Houghton Lake and Northern Michigan area. 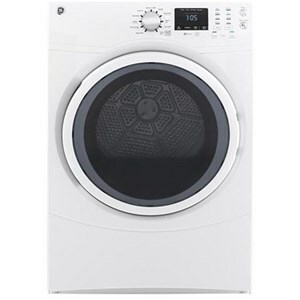 Browse other items in the Electric Dryers - GE collection from VanDrie Home Furnishings in the Cadillac, Traverse City, Big Rapids, Houghton Lake and Northern Michigan area.